Hey everyone! I’m back again, once again with my next Ace Attorney review! This one is for the 5th game in the main series, Ace Attorney: Dual Destinies. It was released back in 2013 and was the first Ace Attorney game to be released for the Nintendo 3DS! I believe it’s also the first Ace Attorney game that got a demo version before release which included a short part of the first case. 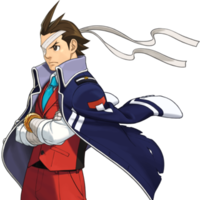 In this game both Phoenix Wright and Apollo Justice come back as playable characters, and they are accompanied by a new lawyer called Athena Cykes. Let’s see what this colorful trio of lawyers is up to! I wish I could give this a higher rating. Thanks to the new and improved Nintendo 3DS, the graphics are almost triple as clean as those from Apollo Justice: Ace Attorney. The now 3D character models look really beautiful and make them feel more realistic than ever before. This makes interacting with them a lot more fun as they have even crazier and goofier movements. Not to mention the absolutely gorgeous backgrounds with more details put in them than any previous installment. During investigation segments you can even look around the room from different angles so they’ve made sure that everything in it lines up perfectly, from the stuff you obviously have to look at to the flower vase in the corner. The trials look a lot more realistic as well, with multiple character models utilising their newfound third dimension to cause some comedic value (think riding off into the sunset ). Now I can’t go talking about the graphics without mentioning the actual cutscenes in the game! That’s right, full anime style cutscenes that play every now and then to add some more flavour to the experience! A real step up from the previous games and it deserves more than a 10 rating. Orchestrated music is always cool. Orchestrated Ace Attorney music? Now that’s fantastic. The soundtrack remains at top level throughout every piece of music that you have the pleasure of hearing. The artists have really outdone themselves here. The recurring Dark Age of the Law theme that plays often really makes you feel the pressure that it’s meant to represent. All three lawyers also have their own remixed or new Objection theme! Phoenix’s is a remix of Trials and Tribulations and Apollo’s is a remix of his original from Apollo Justice: Ace Attorney. Athena’s theme (which is my favorite of the three) is called Courtroom Revolutionnaire, look it up! This game is actually fairly long for an Ace Attorney game. All 5 of its cases are longer than average and due to the new investigating options as well as Athena’s special ability, the Mood Matrix, it also takes longer to progress from one area to another. Not to forget the fact that this game has DLC content, namely a few outfit changes for the three lawyers as well as a brand new 6th case! This DLC case is fairly long too so for once there is actually something to do once you beat the main game. Only, it costs money (though not too much ). The length of this Ace Attorney game might also hinder its replayability. I find myself picking up the original trilogy or even Apollo Justice way quicker than this game, because those can be completed in quicker succession and I can actually do something else that day, whereas with this one you’d be stuck playing it for at least two days if you’re speeding through it. For a game that is purely story based that’s not a good thing in my opinion. For the first time ever in the main series games, every case in it (I guess with the exception of the DLC case for obvious reasons) is related to the overarching story. 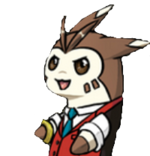 It’s also a direct continuation of Apollo Justice, taking place just a couple months after that game ended. Right from the start in our first cutscene, we see that Phoenix is back to being a defense attorney, so no more hobo Phoenix in this game. Not going to lie, that saddened me at first, I liked hobo Phoenix. We’re also met with Athena Cykes, a young new attorney at the Wright Anything Agency (try saying that 5 times fast). And what’s the first thing we see her do in this game? Well … she fell down the stairs while going to watch a trial. Which about sums up her character; clumsy and unprepared. The next scene shows Apollo covered in bandages looking up at the sky. He appears to be standing in a destroyed courtroom. Kind of like in my post layout to the left haha. Athena meets her friend, Juniper Woods, who is also Apollo’s client. However before the trial starts Apollo passes out and Athena is forced to defend Juniper herself. With nobody there to help her in her first trial. Hopefully she doesn’t meet Winston “Rookie Killer” Payne. And luckily, she does not. But she does find his younger brother, Gaspen “Rookie Humiliator” Payne. And he’s accusing Juniper of more than just murder this time … The rest of the game has one recurring theme; The Dark Age of the Law. After two specific men were disbarred from practicing law, one of them being Phoenix and the other being someone you’ll meet throughout the game, the system fell apart and everyone started faking evidence to get the verdicts they wanted. It’s up to our trio of lawyers to stop that from continuing! This game is challenging as it requires you to think through problems with both physical evidence and logic, but the answers are never too far fetched and it’s always rewarding when you get it right. I’ve said this before but a perfect rating means a perfect difficulty level and not an impossible difficulty level. I never got frustrated with the game, only with myself for not finding the solution. That brings the total to a 9. A great rating for a great game. I still highly recommend playing these games in the order they came out, but if you’re new to gaming and don’t have the option of playing the first 4 titles, this is actually the point where you should start if you’re interested in the series. With the exception of a few series staples every character is new so you won’t feel that left out. To everyone who has played the previous installments, if you liked those you’ll like this one. Anyway, that’s it for me, hope you enjoyed!